Click on our "Cool Stuff" page to view our items for kidz! Welcome to ZLT! 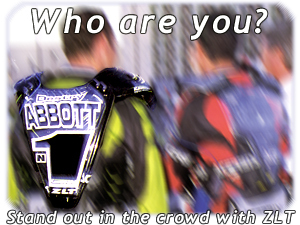 We are your one stop shop for motocross identification. 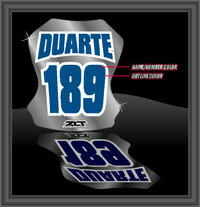 We offer chest protector nameplates, jersey lettering, pre-printed number backgrounds, pants patches, and custom bike graphics. Make sure you check out our "Cool Stuff" page for lots of extra's - pit boards, bar pads, visor strips, bike stands, fender arcs, pit shirts, helmet stickers, custom ice chests, and more! !